Growing in Grace Preschool offers a Christian education while preparing children for kindergarten. Our curriculum offers strong academic preparation, small and large motor skills, and the Distar language program. Everything is taught from a Biblical, Christian worldview. Visitors are welcome. Registration is open to everyone. 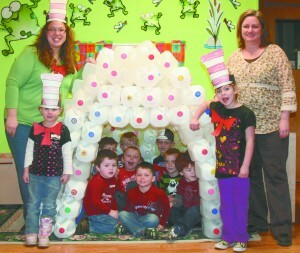 Growing in Grace Preschool students brought winter inside by building an igloo out of plastic milk jugs. Photo by Mike Gainor.